Your pets depend on you for their care, which includes caring for their teeth. Periodontal Disease is the number one health problem diagnosed in pets and according to the American Veterinary Dental Society (AVDS), it affects nearly 80% of dogs and cats over the age of three. Bacteria and plaque can progress into bleeding gums, tooth loss, and can even cause damage to the heart and other internal organs. 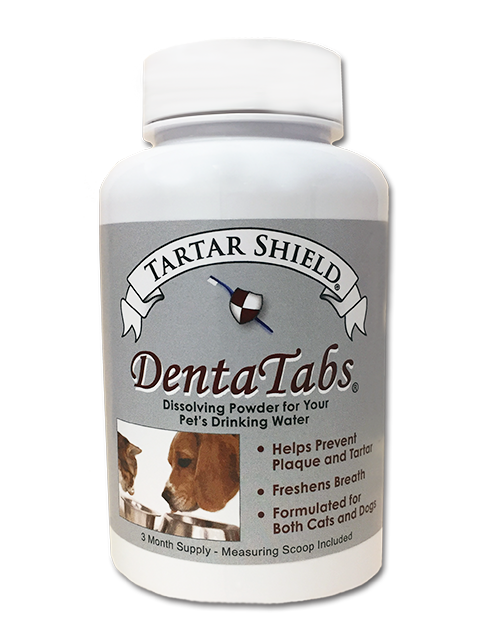 Tartar Shield products are clinically proven to significantly reduce bacteria and plaque, helping to keep your pet healthy and happy. I have been giving my three cats Tartar Shield since they were small kittens. They had a great checkup last month at the vet! She was surprised how good their teeth and gums looked. I give them about 10-12 pieces every night as their bedtime snack. They know when I call out “who wants Tartar Shield” and come running to line up in the kitchen. I have had my dog since he was 4 months old and he is now 9 years old. For the past 5 years, I have had to get his teeth cleaned 2x per year. 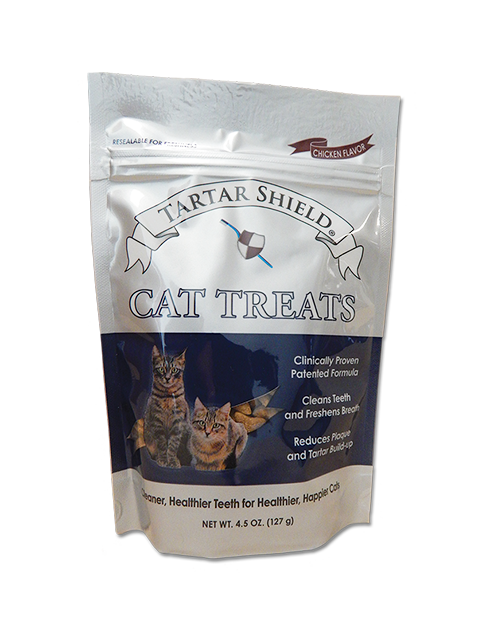 The vet recommended Tartar Shield to help keep his teeth clean between visits. After 3 months of using Tartar Shield’s Soft Rawhide Chews, my dog’s teeth look almost as white and bright as the day after getting them cleaned by the vet. I give my dog 1 chew per day that he absolutely inhales. Tartar Shield’s chews are really a remarkable product. 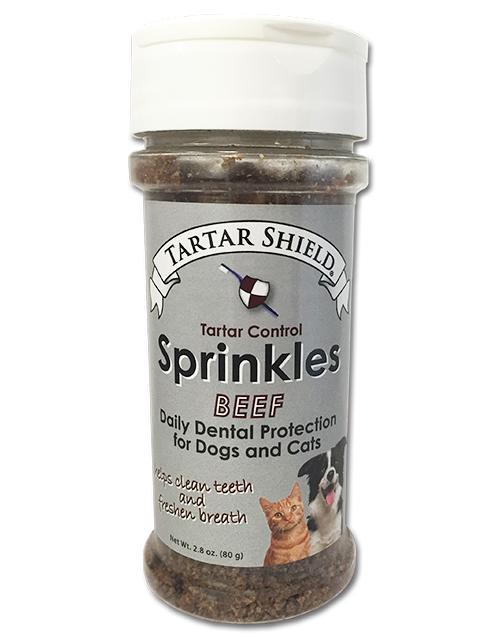 Both of my dogs use Tartar Shield products which are saving their teeth. 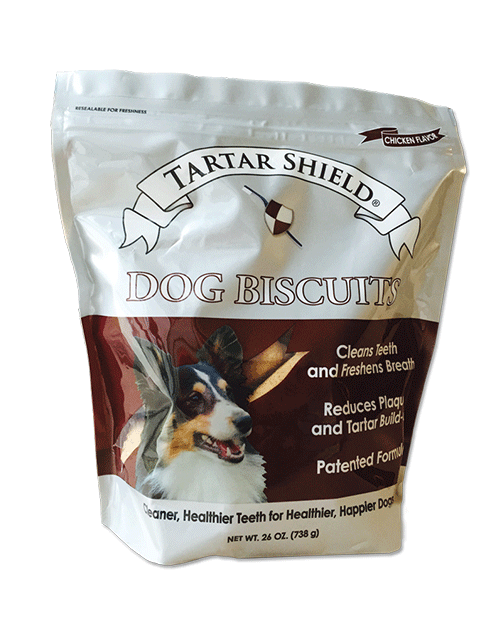 My vet recommended Tartar Shield and my dogs just LOVE them. Thank you! I have 3 dogs and 2 of them are small. I took them in for dental cleanings a few years back and they each had to have some teeth pulled. After that I started giving my dogs Tartar Shield Soft Rawhide Chews every day, and have done so for the past 2 years. When I recently took my dogs in for another cleaning the vet couldn’t believe how nice their teeth looked. I bought this product at my vet in Beaverton Ontario Canada and would like to say it is a very good product . I love the way it breaks up, not like the other rawhide we used to buy that gets soft and then they can choke on it. Thank you. I just wanted to let you know that your product worked miracles for my 12.5 year old Lab mix! He had black tartar on a few teeth and horrible breath but we didn’t want to do a dental cleaning (he eats a mix of wet and dry food). Our vet gave a us a sample of your products and after about 4 days of them his teeth were much whiter, much of the tartar was gone, and his breath was tons better! He loves the products (and he can be a picky eater) and they work much better than the Nutrident we have used for years. He also hasn’t had the reactions he often had to rawhide, which we typically avoid like the plague. Thanks so much. He (and we) are much happier and we will be using these from now on. Daisy loves her healthy kibbles with just a couple of shakes of Sprinkles. The vet says Daisy has the healthiest teeth she has seen on a mini-Dachshund.